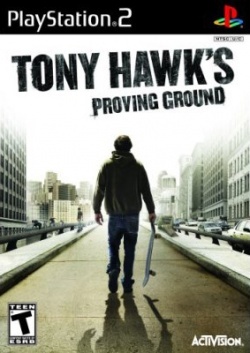 Game description: Tony Hawk's Proving Ground features deeper customization than ever before, including a Video Editor with full-featured editing tools and visual effects for creating epic skate videos, and a fully customizable online Skate Lounge where players can skate with friends in the ultimate pad. In addition, players will have the freedom to skate from single player to online seamlessly, as well as utilize new gameplay mechanics such as skateable terrain altering and building, and Bowl Carving, delivering the most empowered skating experience ever. Tony Hawk-s Proving Ground also features even more Nail the Trick moves such as Nail the Grab and Nail the Manual intensifying the thrill of pulling off big tricks. Europe v01.70(27/02/2003), EE/VU Rounding: Chop/Nearest, None, Playable. Requires VU rounding set to Nearest to fix the major graphical bugs. Stripes persist ingame however, this can be resolved by either using Software Mode or setting Skipdraw to 5, this will however cause other graphical issues like feet disappearing, also removes shadows. Crashes after skipping intro animation for new game unless using software mode and VU Rounding mode is set to nearest. Description: Crashes in menu after trying to show 3D objects. Workaround: This should be automatically fixed as long as Automatic Gamefixes is enabled on the System tab. You can manually enable the fix by going to Config > Emulation Settings > VUs tab, and setting "Round Mode" to "Nearest". Description: Game freezes on the first loading screen. Workaround: Go to Config > Emulation Settings > Speedhacks tab, and disable the "MTVU (Multi-Threaded microVU1)" speedhack. This page was last edited on 28 November 2016, at 12:09.